One of the feature that I like in windows 8 is that you can change the windows 8 login screen or background and can select it of your choice, in earlier versions of windows there is no build-in feature or option to change the login screen. So here I will show you some ways to change the windows 8 default screen. One way is to change the login screen is from “Change PC Setting” that you can open with windows 8 shortcut key by pressing windows-key + I. then from personalize\Lock screen select the image that you want to set as a Lock screen. Other way to change lock screen wallpaper is very simple, open any image in windows 8 photo viewer (simply double click on image). 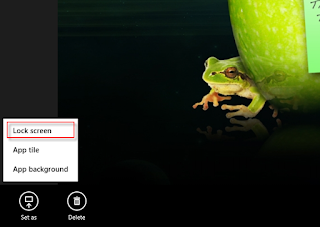 Once the image is open right click on lower corner of photo viewer a menu will appear, and then click on Set as button click on “Lock Screen” to set the image as lock screen background.